French Talmudist; flourished in the first half of the fourteenth century. According to Gross, he lived in Languedoc, but on the banishment of the Jews from that province (1306) he settled at Toledo, where he devoted himself to the study of the Talmud under the direction of Asher ben Jehiel and Abraham b. Ishmael. 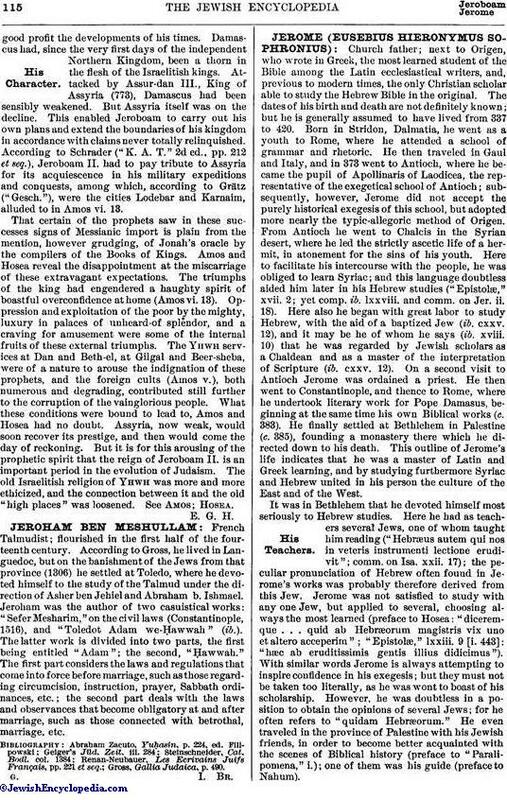 Jeroham was the author of two casuistical works: "Sefer Mesharim," on the civil laws (Constantinople, 1516), and "Toledot Adam we-Ḥawwah" (ib.). The latter work is divided into two parts, the first being entitled "Adam"; the second, "Ḥawwah." The first part considers the laws and regulations that come into force before marriage, such as those regarding circumcision, instruction, prayer, Sabbath ordinances, etc. ; the second part deals with the laws and observances that become obligatory at and after marriage, such as those connected with betrothal, marriage, etc. Gross, Gallia Judaica, p. 490.